Elite Service Provider with Home Advisor, A+ rating with BBB, Licensed and Insured Technicians. 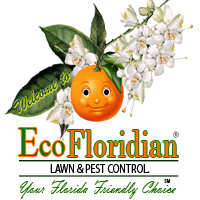 EcoFloridian® Lawn & Pest Control is a local family-owned and operated pest control services company with decades of experience in providing kid and pet friendly pest control services. For all of your certified pest control needs call us for a FREE quote. Our eco-friendly pest control services include the following. Check out our reviews on Facebook, Google Business Pages, Home Adviser and our A+ Rating with The Better Business Bureau. SAFE, CONVENIENT, EFFECTIVE & GUARANTEED! Ecofloridian lawn is doing my lawn for almost a year now treating it on a monthly bases and I’m satisfied. Have been using the lawn and interior and exterior pest control services for nearly two years. John, who does the pest control, is personable, thorough, and reliable. Various other technicians take care of the lawn. Our lawn has improved, but more slowly than I had anticipated -- but no chinch bugs, and that is important. The company provides call-ahead, so you know what day the technician will arrive. Because there is restricted watering in this area and watering is needed within 24 hours after application, I have been able to schedule appointments to coincide with watering days. Any questions or concerns I have had have been addressed. I will continue to use EcoFloridian. They’ve only come out twice, but with the first application all the weeds in my yard died. I have had two different companies prior to them and have complained about the amount of weeds. They both assured me they are on my side and doing what they can. I tried EcoFloridian and weeds gone in one application. This has been an ongoing battle for 1 1/2 years. I am very happy! Please be an accurate during spaying fertilizer. Just hired, we'll see how yard looks come spring! On Time, very courteous! Service h as been done on the day that it was scheduled, Keth answered any and all questions that I asked him I am happy with the service. I still have weeds present in the yard and sand spurs are taking over the yard. So far so good. The men are always willing to spend time to answer questions. They are courteous and polite. Danny was very courteous. He arrived on time and addressed my concerns. John came when promised and was very professional in his application of pest control to my home. Great service, will continue service. My lawn guy Keith is the best. My yard is working towards awesome. Thank you Mrs. Minguy! Glad to hear your lawn is looking great. What bothered me was the upsell notice attached to my invoice for the seasonal granular fertilizing at additional cost. I was led to believe the contact includes dry fertilizer, if not we will have to adjust the monthly price or terminate our agreement. Just got back from 5 months up north and I am disappointed in the amount of weeds in lawn, lots of sedge grass and other stuff I don't what it is. Service is good , . Your Billing not to sharp, you gave me a double bill again last month. Still not that happy , you cost me two months , no service. Have a nice day Al. We have a difficult lawn with some problems and the technicians who have come to our house have always done their best to help me solve any concerns we have. Our grass is a lovely green and hopefully we can help keep it looking nice during the cooler weather. One of our "problems" is an armadillo who digs holes everywhere. I wish you could cover the yard with an anti-armadillo spray! Just kidding. Keep up the good work! Great service and communication with both John and Kate in the office, which is why we’ve given your company all our business. John, is courteous, thorough, and extremely pleasant. I can't thank him enough for his good service. We have been very happy with the service we have received. Bruce was on time and very efficient. He help me aim toward resolving all my problems with the rain machine app. THEY RESOLVED THE ISSUE WE HAD WITH THEM, AND CAME THROUGH WITH GREAT SERVICE. THANKS VERY MUCH FOR A FINE SERVICE CALL, REALLY APPRECIATE THE FAST SERVICE. Your guy came the second time, because I had no electricity from the hurricane the first time he came. Also, he was not supposed to do the bushes. They had been done. It said so on the contract I signed. I was billed, but I called and the situation was taken care of within a few minutes. First, Keith was very professional and friendly. He explained what he was going to do and if we had any issues he would address them. We feel confident we will be happy with the services. Keith is an asset to the company. I have seen improvement in the lawn quality, as I do have more grass, but not quite to my expectations. Since I have not lived in Florida very long, I don't have a lot of past experience upon which to base my expectations for a Florida lawn. Growing grass where it is not a natural plant and in sand is a challenge in itself. I have lived in the north and western parts of the country where grass seems to respond more noticably to fertilizer and bug treatment. The biggest challenge is the timing of the treatments, watering schedules, and getting my lawn service to leave the grass taller. I travel a lot, so being available to witness the treatment and mowing is difficult. Seeing the results after a year will help in providing a more honest assessment of the services. Danny is professional & pleasant. He takes a personal interest in our lawn's condition as he cares for it. We appreciate that. My lawn looks very good. Staff very friendly and professional. Keith was very friendly, courteous and professional. He listened to my concerns about the lawn and explained what he would be doing to achieve my goals. The only reason I answered your last question as a 5 is that I am waiting to see the results your service produce until I would consider recommending you.